I finally setup a GetSatisfaction community page. You can use it to Ask Questions, Report Problems, Share Ideas or Give Praise. Let’s how this works out for us. or click the Red “Feedback” button on the left. Meanwhile here is the first company offering KAG server hosting. If you want your own, really good server in US you can rent it. I am supporting them so you can expect the best service. I changed the master server. The old one was totally unreliable, sorry for that. The new master should update when you launch KAG. Attention server owners! Restart your servers! I see lots of people today! Welcome! 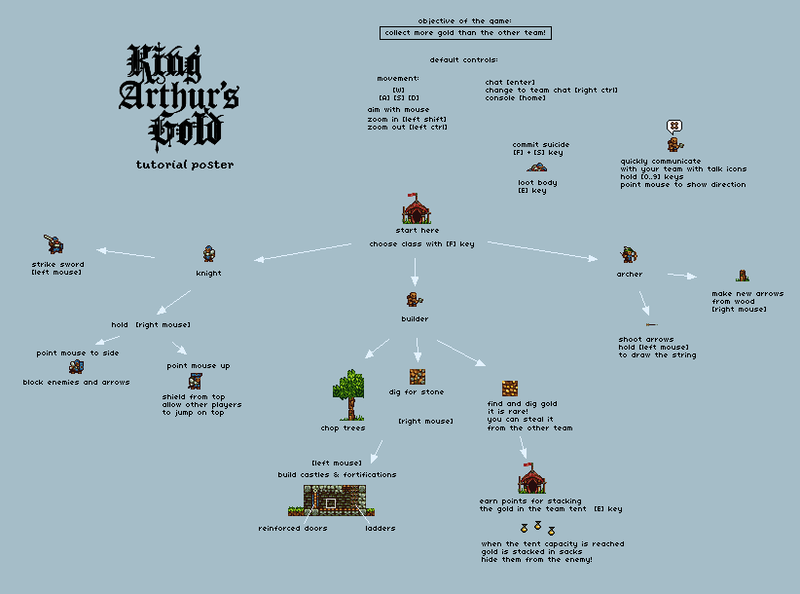 I am re-posting the tutorial poster for you. It is a bit outdated because there is new stuff like bomb and catapult. You also have to stack gold in the 3 sacks you have at your base. There are some issues, like sometimes the servers list doesn’t download. You can always connect manually to 78.46.112.151:50301. I will be fixing this shortly though. Should be fixed now! I released a couple hotfixes after build 40. All updates download automatically. The crashes on map restart should be fixed. You need to restart the server so it fetches the update. As an experiment I made a map with a mountain in the middle instead of a hole. You can play it on the Official Euro Server. If you can’t update the servers list please download the game again and install fresh. I’m working on the new version, should be out this week.